built, displayed and marketed in this small northeast Indiana city until 1938, when the effects of the Great Depression brought an end to a transportation empire. That thriving auto empire was the work of E.L. Cord, a visionary industrialist who owned or controlled some of America's leading corporations in the field of personal and public transportation. Recruited from Chicago in 1924 to energize Auburn's sluggish sales, the 29-year-old Errett Lobban Cord was a dynamic super-salesman, whose success was so immediate he was installed as president the following year. Auburn grew remarkably in stature thanks to Cord's business acumen. 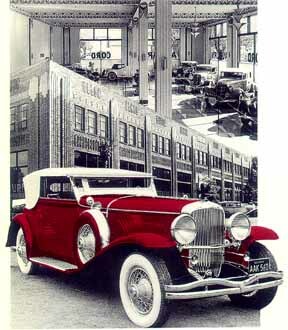 In 1926 he purchased the Duesenberg 1929 Cord L 29 Sedan Automobile and Motors Company, Indianapolis, builder of unsurpassed racing and passenger cars. breath-taking art deco showrooms of America's most esteemed builder of grand luxury marquees. You've just envisioned the Auburn Cord Duesenberg Museum, in Auburn, Indiana, the "Home of the Classics." 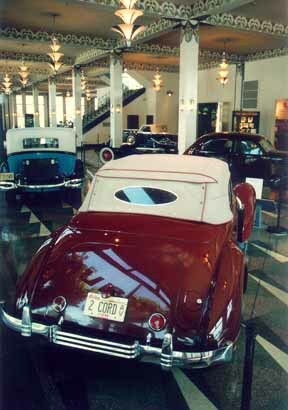 The museum building was built in 1930 and designed by A.M. Strauss, Fort Wayne, Indiana. The 80,000 square-foot building is one of the finest examples of art deco architecture extant in the Midwest. The Auburn administration building housed the showrooms, executive and general offices, engineering wing, experimental department, design studios and telephone switchboards, until the company's end in 1937. Today, the two-story art brick museum building is listed in the National Registry of Historic Places. In a dramatic pilgrimage like no other, the classic 1920's and 1930's automobiles of Auburn, Cord and Duesenberg return to Auburn, Indiana. They come home to the city of their origins, every Labor Day holiday weekend. Visitors to the Auburn Cord Duesenberg Festival also enjoy a multitude of family events, including an antiques show, quilt show, arts and crafts show and decorator show house. Most impressive is the thrill of seeing and hearing the glamourous classic cars, nobly inhabitating the local streets, demonstrating the sound and movements of genuine rolling sculpture. 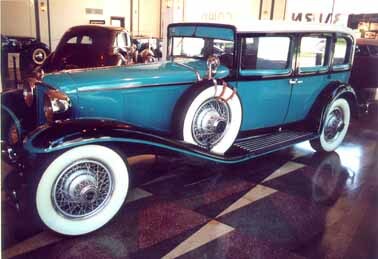 For more information about visiting the Auburn Cord Duesenberg Museum, or joining their membership, call (219) 925-1444.